Good morning everyone! It's time for another great challenge at Create with Connie and Mary! This week we have a fun sketch to work with! Take a look! I wanted to do something a little different so here is what I came up with! I used the Best Day Ever and Simply wonderful SAB sets and I like how it came out! 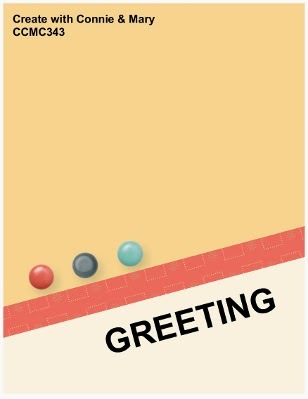 I hope you enjoyed my card and are inspired to play along! For more fabulous inspiration, be sure to visit the Create with Connie and Mary site! I look forward to seeing your awesome creations! Thanks for stopping by and have a super day! This is such a cute card, Deb. Love the way you placed the fringe behind the panel. This is so sweet and spring-y! Love these dainty flowers with the fringe accent! Great idea! Love the fringed grass peeking out below the flowers - just darling! Pretty fussy-cut flowers and the fringe grasses is so clever! This card is so fresh with the pops of colour against the white background. Love the fringe trim too - I keep forgetting I have those scissors and this makes a fun border. What a clever card!!! I love the little bit of fringe grass along the diagonal for grass! 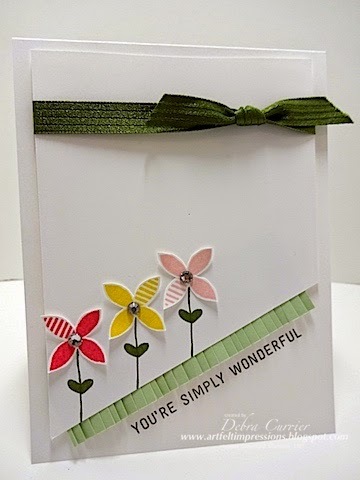 A gorgeous clean and simple card!